De toeristische hoofdstad van het bergachtige noorden van Vietnam is ongetwijfeld Sapa, een dorpje dat aan de westelijke rand van een hoog plateau is gevestigd, met uitzicht op de wazige blauwe piek van de Fansipan berg en omgeven door ethnische minderheden, zoals de Rode Dao en de Zwarte Hmong. Het frisse klimaat is een welkome afwisseling voor Europese bezoekers, met name in de hete zomermaanden. Een handjevol oude gebouwen is overgebleven, de rest is verloren gegaan tijdens de Chinese invasie die plaatsvond ik 1979. Dit heeft voor een moderne ommekeer gezorgd in het bergdorpje, waar prachtige trekkings worden georganiseerd. De prachtige uitzichten op de groene rijstvelden en een prachtig meer in het centrum maken het een plek waar je alleen maar van kunt houden. Sapa zelf is vanwege het toerisme weinig Vietnamees, maar de winkels en marktjes bedienen nog altijd de dorpen van de ethnische minderheden om het dorpje heen. Elke dag is helder en levendig in Sapa, met de vrouwen die gekleed zijn in de gekleurde traditionele gewaden en versierde hoofdtooien. Jonge Hmong meisjes worden regelmatig hand in hand gespot met westerlingen, die bevriend zijn geraakt vanwege hun vriendelijke en vaak humoristische verkooppraatjes. De Rode Dao, een andere bevolkingsgroep, zijn meer verlegen en worden over het algemeen vaker gefotografeerd vanwege hun prachtige opvallende jurken. De dagen kunnen warm zijn, maar in de avond koelt het veelal af. Vergeet dan ook niet warme kleding mee te nemen! Wanneer de zon vroeg achter de Fansipan berg verdwijnt daalt de temperatuur in de koudste maanden vaak onder de het vriespunt, wat sneeuw met zich mee kan brengen. Een hotelkamer met verwarming is dan ook geen overbodige luxe. De beste maanden om Sapa te bezoeken zijn dan ook van september tot november en tussen maart en mei. Wat Sapa in eerste instantie groot heeft gemaakt is de lokale weekendmarkt, welke hedendaags nog steeds erg populair is bij bezoekers. De zogenaamde liefdesmarkten zouden vroeger veelal door de lokale bevolkingsgroepen worden gebruikt om hun vrijgezelle jongeren heen te sturen om op zoek te gaan naar een leuke dame of heer. Te koop zijn ontelbare gekleurde tassen, shirts en andere zelfgemaakte producten. Ook aan te raden zijn de Can Cau en de Bac Ha markt, laatstgenoemde op zondag. Dit museum beschikt over videopresentaties die de geschiedenis van Sapa en de levensstijl van de lokale bergstammen laten zien, hetgeen over het algemeen als leerzaam en boeiend wordt beschouwd. Ook wordt er aandacht besteedt aan de lokale architectuur, neem dus zeker een kijkje! 3 days Sapa with 2 days trekking in Sapa starts $ 149 | $ 45 per day all incl. coach bus + hotel +2 days trek + homestay + cooking with locals + meals & more... Note: We depart daily at 6:30AM by luxury limocoach bus from Hanoi and return We know our stuff over the years and we don’t mince our words. Going by luxury touring coach bus to Sapa in a relaxed way with your own soft coach seat, travel in a relax way to Sapa! Designed with great variety, these trekking experience are geared towards travellers searching for a healthy mix of active exploration, uncommon landscapes, unique non-touristic trekking and local cultures. Are you ready for the "Real Sapa Experience"! Introduction After a really comfortable drive with the morning coach bus from Hanoi we arrive in the early afternoon in Sapa. Such a colorful town thanks to the H’mong and Dzao people from the local hill tribes who head into the town’s market every day to trade their produce. The region as also known as “the Tonkinese Alps”, Sapa is just a lovely hill station town in Northern Vietnam near the Chinese border. Enjoy a very warm welcome from our local (Hmong or Red Dzao) tour guide who will guide you through this stunning piece of Vietnam. From the lush terraced rice paddies to the rustic charm of the native dwellings, Sapa is a place you’re sure to fall in love with! Many diverse groups like the Dzay, Dzao, Tay, Xa Pho or Hmong populate this richly cultural northern territory. You’ll sample their unique delights as you pass through each village, trek 2 days and overnight with the local Hmong minority family in an homestay, enjoy cooking with locals & lovely 30 min herbal foot massage. We hope you are ready for our non-touristic trekking. This is a trip you’ll remember for the rest of your life... With this trip, we have built our reputation! CHECK OUR LATEST PROMOTIONS & OFFERS: Last Minute Deals | Happy Birthday Discounts | Promotions Friends Travel Vietnam offer discounts for groups of 4 or more, we encourage groups to book with us by offering discounts for group bookings. For detailed information for bigger groups, prices and tickets, please contact us! FRIENDS TRAVEL VIETNAM’S LOUNGE WAITING AREA & SERVICES As special privilege for our clients Friends Travel Vietnam has his own private Lounge waiting area at our Office in Hanoi, just for your convenience to relax or to get refreshed. Free services: Breakfast service, drinks, shower service, internet, computer & print service, lounge coaches/beds, secure lugage storage room, Hanoi City map, trekking shoes & gear Extra Services: Laundry service. AIRPORT PICK UP & DROP OFF SERVICE Friends Travel Vietnam offers wide range of transportation services for all over Vietnam especially car rental service with private driver & Airport Transfer Services. We specially take care from your moment of arrival until leaving. We pay attention to detail & understand your expectation. We do not simply provide transportation services, we aim to be your travelling companion. More info or book directly airport transportation click here... IMPORTANT TO KNOW ABOUT REAL SAPA EXPERIENCE BEFORE YOU BOOK WITH US Please note that we try at all time to give an accurate illustration of the proposed itinerary for your Real Sapa Experience. This is our strength to be open and honest and to be clear in information to our clients with our reputation during the time we operate, you are traveling to most popular touristic destination in Vietnam. Friends Travel Vietnam spend a lot of time in writing our trip notes, this as our intentions are not to create over expectation of your trip, and giving you a clear view what to expect on a trip like this as also what to prepare and to take with you. That’s why we would like to share joining a trip like this with clear directions and details to give you all a great ones in a time life experience, just to caught a glimpse of breathtaking Sapa and a real local life experience in 2 days. TRANSPORTATION MORNING COACH BUS FROM HANOI TO SAPA TOWN & RETURN HANOI You booked a comfortable drive with the morning coach bus from Hanoi to Sapa town and return by afternoon bus you will required finding on your own the way to the meeting point(s) where your bus will depart. IS THIS TRIP THE RIGHT ON FOR YOU? 1. Our basic trips include one night or more in simple homestay accommodation with local family, and there a few ways to better understand a country and its people. You will sleep on mattresses on the floor in a mixed-gender dormitory style if this is not your cup of tea we will advise you to book the hotel option. 2. This trip includes a moderate level of hiking in the hills and mountains during this trip, ranging from 6 to 8+ hours. Although this hiking is possible for most travellers, a good level of fitness will help increase your enjoyment of this experience. 3. Weather conditions might affect the level of hiking into challenging to difficult level tracking. We strictly advice to be prepared for the weather conditions with the right gear, our tracks can be on muddy roads where it might be slippery where some situations the track can be classified as dangerous. 4. In very bad weather conditions as, thunderstorms, storm or typhoons we cancel a part or the whole tour, with heavy rain or rain fall we might delay the trip and adjust the road depending on the weather forecast. 5. Pregnant women will be not advice to join this trip, people with heart diseases or heart problems or weak fit level are not advice to join this trip. 6. Please note many of our Adventures tours operate with a minimum of 1 person, so there may be instances where you are the only person on the trip. 7. The group size for our Real Sapa Experience is limited to 6-8 persons who join in the tour, to create an unique experience. For group tours booking we might run higher number of attendants as an private group tour booking. 8. 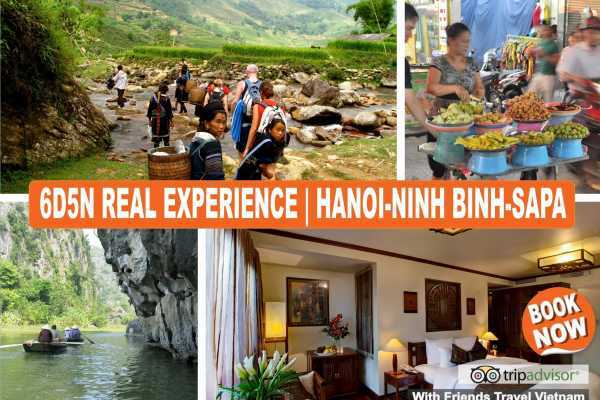 This experience is a ‘join in’ group departure, which means for some portions of this trip, such as at the homestay, you may join-in with other travellers who have booked on a different style of trip, or through other companies Friends Travel Vietnam work with. If you booked a complete private tour with private homestay this will not applicable. CANCELLATION POLICY FOR REAL SAPA EXPERIENCE BOOKINGS - More than 30 days prior to check-in: free of charge - From 30 to 7 days prior to check-in: 10% of total rates - From 6 to 3 days prior to check in: 50% of total rates. - Less than 3 days prior to check-in: 100% of total rates. - No-Show: 100% of total rates. Cancellation notice must be send to us via email. Refunds will be processed in between 48 hours or directly at our office during openings hours. CANCELLATION DECISION MADE BY LOCAL AUTHORITY When cancellation decision are made by teh local authority on the day of the trip in case of bad weather conditions or other safety matters. In such case, we will make alternative travel arrangement for you on request or offer refund in accordance with the cruise policy on the non joined services following your itinerary. Refunds will be processed directly at our office during openings hours. ITINERARY DISCLAIMER This information has been compiled with care and good faith. They give an accurate illustration of the proposed arrangements for this holiday. Occasionally our itineraries are updated during the year to incorporate improvements stemming from past travellers' comments and our own research. The information given in your itinerary may be slightly different on the day of your departure. It's very important that you print and review a final copy of your Itinerary & Trip Notes a couple of days prior to travel, in case there have been changes that affect your plans, we always handover before your departure our latest updated itinerary. If you have any queries, please contact us directly we are here to help you! While we operate successful different options for our “Real Sapa Experience” trips in this region throughout the year, some changes may occur in our itineraries. Circumstances beyond our control such as changes in local conditions, inclement weather to timetables and transport routes or other reasons could force us to make changes to this itinerary. Any costs shown are subject to change, though are an accurate reflection of costs at time of writing. This can happen with little notice so please be prepared for modifications to the route. The order and timing of included activities in each location may also vary from time to time. Please also note that visa requirements are subject to change and are the responsibility of the traveller and not that of Friends Travel Vietnam. PAYMENT INSTRUCTIONS To secure your booking, you have to settle your down-payment with us. The balance due is payable upon your arrival in Hanoi at Friends Travel Vietnam office at 62 Hang Buom street, on the day before your scheduled departure. It’s possible to settle by cash or credit card (settle by card there might be an applicable transaction fee). Be aware that our prices are not inclusive of transfer fees levied by your bank and oversea bank - please ask your bank to transfer the sum prior deduction or any shortfall. The booking is only confirmed when full payment is completed on at least a day before your departure or if agreed others by email. We reserve the right to release part or full booking if the full payment is not completed as deadline. Payment in Vietnam Dong is to be made equivalent to the amount in United States Dollars at the official exchange rate of the VietcomBank at the time of your booking. TRIP NOTES We recommend that you take a moment to read through this information before travelling, and would appreciate any feedback on how well it's being implemented in the field. 6 days starts from $ 379 | $ 63 per day All Incl. Transportation + Fees + Meals + Mountainbike + Guides & Porter + Guides + Accommodation Looking for active exploration of the beautiful North of Vietnam? You just found it! Conquer the Fansipan mountain, which with a height of 3143 meters is the highest in Indochina and visit the famous and colorful ricefields in Sapa in only small groups of max 6 people & our "Real Sapa Experience", together with your private local guide and porter(s) for the Fansipan trek with a extreem Mountain bike trip Check availability first wit us: Contact us Are you ready for the "The Real Extreme Sapa Experience"! CHECK OUR LATEST PROMOTIONS & OFFERS: Last Minute Deals | Happy Birthday Discounts | Promotions Friends Travel Vietnam offer discounts for groups of 4 or more, we encourage groups to book with us by offering discounts for group bookings. For detailed information for bigger groups, prices and tickets, please contact us! Introduction The Fansipan mountain, also known as 'The Rooftop of Indochina', is the perfect challenge for visitors who like actively exploring. It's located in the Lao Cai province, the northwest of Vietnam, and popular among ecotourists, photographers and travellers trying to escape the overcrowded standard touristic spots. Make sure you don’t miss out on this spectacular wonder of nature, and experience Vietnam like you will nowhere else. They say it's one of the most fascinating spots in the north, it’s your task to find out! The Fansipan Mountain arose 100 million years ago out of the platonic depths in the area which these days is called the Lao Cai provence. As you climb you way up, the changing landscapes make you doubt if you're still on this planet. The flora and fauna create a unique atmosphere, and evolve every day, like the have been doing for a long time. Rise above the clouds as you reach the rooftop of Indochina, we'll promise that you'll love the view. Then Sapa! With our "Real Sapa Experience", from the lush terraced rice paddies to the rustic charm of the native dwellings, Sapa is a place you’re sure to fall in love with! Many diverse groups like the Dzay, Dzao, Tay, Xa Pho or Hmong populate this richly cultural northern territory. You’ll sample their unique delights as you pass through each village, trek 2 days and overnight with the local Hmong minority in an homestay, enjoy cooking class & 30 min herbal foot massage. . Conquer the Fansipan mountain & join our "Real Sapa Experience with us! Brief Itinerary Day 1: Hanoi - Sapa Overnight train from Hanoi to Lao Cai - Sapa). Day 2: Sapa - Fansipan (B-L-D) + Homestay We'll start our climb up the Fansipan Mountain in the morning, at a height of 2000m. Enjoy the flora and fauna as we climb our way further up. After lunch we'll continue to climb, until we reach "The Rooftop of Indochina" uur final climb to the 3143m high top of Fansipan mountain will be rewarded with an incredible view. Return by cable car, sleep local homestay. Note: attendants need to fit to climb the mount Fansipan!! Day 3: Fansipan - Giang Thai Chai (B-L-D) + Homestay Today we going on adventure, for a mountain bike trip on a non touristic route. Where we going on the pavel & unbeaten track for a 27 KM ride, sleep local homestay Day 4: Sapa - Y Linh Ho - Lao Chai - Tavan (B-L-D) + Homestay It's time to explore the beauty of Sapa! With our unique "Real Sapa Experience" on a less non-touristic unbeaten tracks. Today's trekking will take us through a bamboo forest, a beautiful waterfall and more spectecular scenery. Our local tour guide will take you after breakfast an the unbeaten tracks for a 12 KM trekking today. Make sure your camera is charged! We'll have lunch at a local family, see how they live and learn how they cook their food in a traditional way. Cooking with locals and enjoy a 30m massage as well, after your amazing dinner. So you'll be ready for some more trekking tomorrow! Day 5: Tavan - Giang Ta Chai - Sapa - Hanoi (B-L-D) Visiting the Red Dao people, and see how they fabricate their own clothes is next on the agenda. Several other villages will be visited, where we will see their old-fashioned weave techniques and of course green rice paddies. There will be more enormous rice fields to see as we walk along and eventually cross the Hoa River. It's possible to take a shower, before we head back to Sapa Town. Standard we take the overnight bus or (optional train) to Hanoi. Day 6: Hanoi (B) Arrival in Hanoi in the early morning! If travelling by nicht sleeper bus, you can have an early checking in our dormstay to have a sleep. Break fast will be served at our office. The trip has ended. In the early morning 4AM we arrive in Hanoi at the bus stop/station, where your trip ends. It's possible to get a direct connection for tours to Halong Bay the departure times are around 8 AM.